Coined the “fruit of the angels” by Christopher Columbus, papayas continue to offer their “heavenly” taste to people all around the world. This September, celebrate National Papaya Month with this sweet tropical fruit. Loaded with rich nutrients and antioxidants, papayas are rich in vitamins A, C, and E, as well as potassium, calcium, and iron. Moreover, papayas calm inflammation of the body, and support healthy digestion. Enjoy this delectable treat and savor the refreshing taste of the tropics. ​India became the primary papaya distributor. ​Global production was 13 million tons, with India responsible for 44 percent of the world’s total. ​As of 2010, 80 percent of Hawaiian papaya plants were genetically modified. University of Hawaii scientists, who made the modifications, offered the seeds to farmers without charge. ​Papayas fight back against attack. ​Papyas suffer from the ringspot virus, and to fight against it, genetically altered papaya were approved and brought to market. Papaya contains a plethora of nutrients, which are especially good for your hair. Papayas help add volume, prevent balding and dandruff, and make hair strong and bouncy. Mash papaya and use as a soothing facial mask. The enzyme papain, along with the alpha-hydroxy acids, dissolve inactive proteins and dead skin cells. This, in turn, will make your skin lighter and softer. With papaya as the main ingredient, blend together your choice of fruits and sweets to create a delicious treat for a snack on the go. 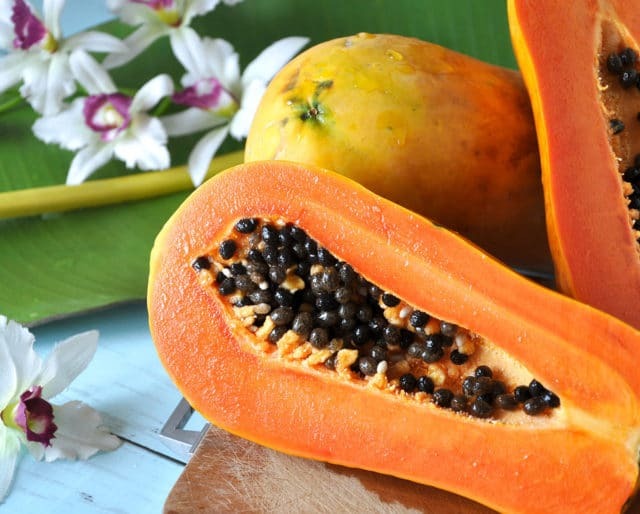 The enzyme papain, found in the skin of papayas, works as a great exfoliant. This enzyme helps to remove dead skin cells from the top layer of skin — leaving it looking fresh and revitalized. ​Unripe papaya fruit and leaves contain papain, which is a natural meat tenderizer used all around the world. The proteins and amino acids found in the pulp can make your hair thicker, stronger, and healthier. You can help fix your split ends by simply adding more of this fruit into your diet, or by applying it directly to the hair. ​Papayas contain enzymes that aid in digestion and help to balance the acids in our stomach. They can relieve nausea and help take away the side effects of morning sickness. ​Papayas are one of the only fruits available all year round. The beneficial enzymes in papaya weaken as they ripen more, so it’s best to use them within a day of buying. The nutrients found in papaya help relieve symptoms in those suffering from conditions made worse by inflammation, such as asthma or rheumatoid arthritis. Papaya helps to keep eyes bright and protected — while also fighting cataracts. Papaya is a source of beta-carotene, carotenoids lutein, and zeaxanthin, which protect against high-intensity blue light and reduce the onset of age related macular degeneration. Papayas contain a number of vitamins, but are particularly rich in vitamin C. A small papaya contains about 300 percent of the daily-recommended vitamin C.